In January Met and Ben came to work in Cambodia as church planters with the Kuy People. They are sent out by the Christian Mission Fellowship (CMF) in Fiji (see www.cmfinternational.org.fj for more about this church.) That church has been praying for the Kuy people for a number of years now. These workers are an answer to our prayers. Here is a little more of their story. Met was born and raised in Suva (main city of Fiji) in a Christian home. During High School he made a personal commitment to Jesus Christ and after only the first year of University he felt called to Christian work and joined CMF to be trained in church planting. His heart was always to be sent out to plant churches among an Unreached people group. Having completed his training, in 2000 he was sent to Australia with one other single man to plant a church. By 2004 the church was ready for a pastor. In 2005 he, along with Ben was commissioned during the annual church conference to come work with the Kuy of Cambodia. Ben was raised in a Christian family on a coconut plantation on the island of Vanua Levu, the second largest island in Fiji. He joined the Bible school at CMF in 1993. 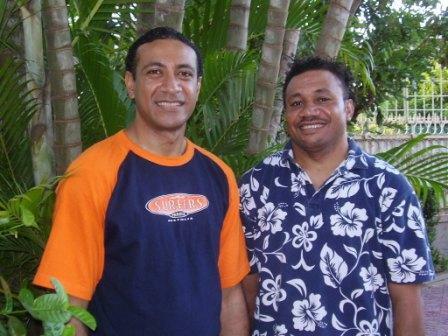 He received some practical experience in church planting on one of the small islands of Fiji. From the time he entered Bible school Ben has had a heart willing to serve wherever he is needed. His divisional head suggested he be interviewed to go to Cambodia. One of Ben's gifts is his musical ability. Since their arrival, Met and Ben have been focused on language study. This is a significant challenge. Ben calls Khmer tongue-twisting. Met had to go back to Australia for a while due to visa issues. He used the time to connect more with the CMF churches in Australia who are supporting the two men in their mission work. Ben says that he has experienced more homesickness here than at any time in the past. In spite of that, he and Met have quickly fit into their neighborhood here in Phnom Penh. Within the first month they had begun teaching conversational English to neighbors and started a house church in their house. They are working with a young man, Piron, to help him grow so that he can lead the group. He is from a Christian family in the neighborhood and was very happy to have believers come to his neighborhood. Pray for ability to learn to speak Khmer. It will be essential for their ministry. Pray that members of the house church that currently meets in their home will grow spiritually and that Piron will be ready to take up leadership when they leave for the Kuy village. They need the Lord's wisdom and guidance on when to move to the Kuy village, which one to go to and what approach to take.